With the information shown here your electrician can laterally place the lighting outlet boxes for the four wall sconces shown on the sides of the mirrors. The center of the two lighting outlet boxes at the far left and far right are 9" from the side walls. The two lighting outlet boxes for the two inner sconces would go at 63" from the side walls to the center. 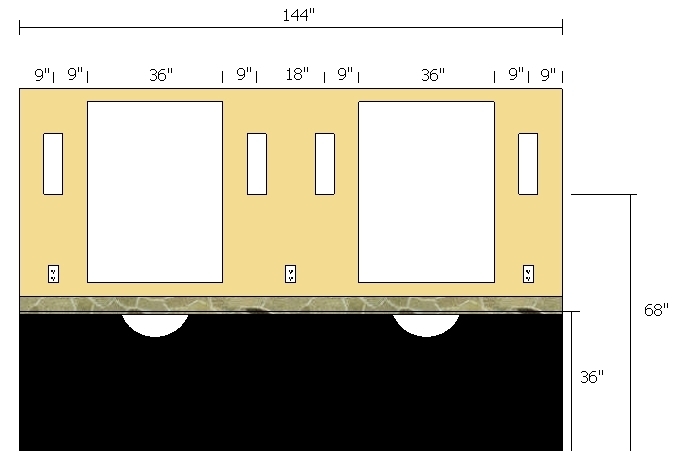 These dimensions were not difficult to figure out because the electrician will see on a general notes page included with plans that the widths of the mirrors are 36", and the center of the mirrors/sinks are at 36" from the side walls, and he will be able to measure the room's width while onsite and determine the room is 12' (144") wide. Now there is one problem left- the height of the outlet boxes for the wall sconces. Light fixtures vary in size, shape, and style in every possible imaginable way. Another way in which they differ is the point where the attachment holes are on the rear plate of the fixture. Some fixtures have these holes toward the top, some toward the bottom, and some have them directly in the center. One can never assume where they are so it is best to look at the manufacturer's specification/installation sheet to determine this so the bottom of the fixture ends up at the correct height when all is said and done. This also means that the homeowner must decide which fixture will be installed here before the electrical rough-in is done for these fixtures. Take a look at this lighting plan- zoom way in to the master bathroom vanity area- and see that the sconces shown at this location are shown with a fixture designation letter of B next to them. Then click on this lighting fixture schedule and click on the link for the type B fixture. This should take you to the manufacturers website and to the exact page for a description for these fixtures. Here you can see the fixture is 18 1/2" tall (height). On this page you will see a link for Instructions (English) and when you click on it you will see an illustration showing the mounting holes in the center of the fixture. So, if when installed, we want the fixture to be 68" to the bottom we must install the lighting outlet box 9 1/4" (half of the overall height of the fixture) above 68". This means the outlet box would need to be installed at 77 1/4" above the floor.